This morning early panicked investors liquidated at 1000 points down on the DOW. By noon it was only 200 points down. Savvy speculators placed opening bids far below fair value and in the presence of panic selling, some of those ridiculous orders were triggered. The lesson: simply do not sell when their are no buyers. When there are no buyers, this is a sign of the final stage of panic. No one is willing to wait to sell. That means by the end of the day, there will be no more sellers and prices will rise. Overnight 2 out of 3 Asian markets are up between 2 and 3% as I write this. Two articles today questioned what is driving oil down. It is not supply and demand. 160 million barrels of oil have been sold that do not exist – i.e. short sales. This is greater than in 2008. See interesting article here. The U.S. economy has been getting weaker for several months. Normally at this stage of the business cycle, the Fed would be moving to quantitative easing. Instead, without Bernanke’s leadership, the remaining weak Fed governors are attempting to prove they know what they are doing by raising interest rates, just because they said they were going to, when all markets are tanking and huge layoffs are in the offing. Keep your cool and do not sell into this panic. If you need the money in the next two years, what were you doing in the market in the first place? Good news … Yahoo Finance finally has the “yield” calculation working for MORL. The dividend yield at today’s price is 26.5%. In 4 years you’ll have your money back even if it goes to zero. Since 1988 the S&P 500 returned 713%. 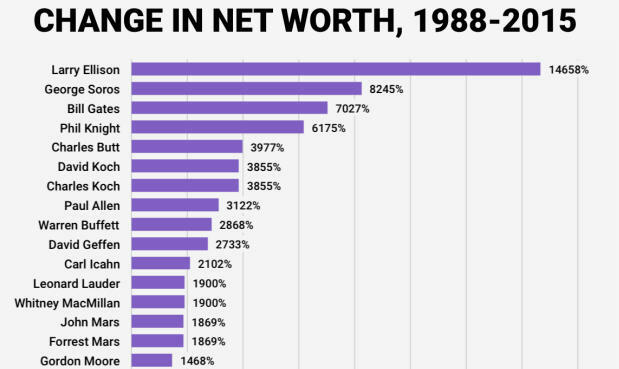 According to Yahoo Finance (link above), 15 people have done twice as well or better. That is a very small number. There may be others, of course, but they are not wealthy enough to have been mentioned. Only 4 of these people did 4x the S&P return. Donald Trump did only half as well as the S&P 500. That’s still better than I did during the period. I admit my long term returns are bad. I did not even hear of the “equity premium” until 2002, and did not understand the principle of index investing until about 2013, the year I published a paper on on the equity premium and wrote a book about it. At that time, I was already invested in some things that were destined to crash, and was not brave enough to exit them (Russia, mainly), especially as they were doing great at the time. Most of the S&P’s gain, for that period, came between 1988 and 2000. Since then it’s been relatively flat. From the 2000 peak to the May 2015 peak, the rate of price return was less than 1.8% per year. Dividends during that period averaged about 2%, giving a total return of about 3.8%, better than treasury bonds, but not quite as good as corporate bonds. Did the equity premium disappear? Since the 2008 peak, before the financial crisis, price gain has been 3.8% per year, for a total return of around 6% and beating grade A bonds by a couple of percent. If you are curious about the dividend history of the S&P 500, you can find it here. In the 1800s it was 4-6% range. 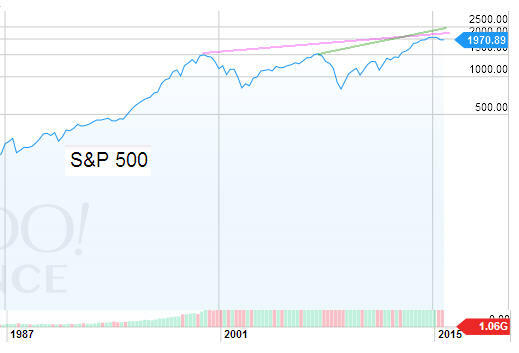 It tends to spike when the market crashes, like in the 1930s, simply because the price of the stocks takes such a hit. The dividend yield fell to 3% in the 1960s, rose briefly around 1980, and declined to 1% at the peak of the internet bubble in 2000. Since then it has been generally rising. I expect it to continue to rise. I’d be surprised if dividends were less than half of returns going forward. I’m assuming comparison based on peak to peak. Obviously if you can time the market you can do better, but I don’t know anyone who can. There are a lot of headwinds to growth going forward, including the rise of political instability, and the maturation of several developing economies such as India and China. China has grown by stealing other people’s markets with cheap labor. They even stole from Latin America and Japan, not just from the U.S. and Europe. They could grow further this way, for example by making cars, but it’s not likely to be as rapid, and they have a quality and image issue which they have not yet aggressively addressed the way Japan did in the 1960s. Russia just took over from Saudi Arabia as the world’s top oil producer. An article calls it the RED DAWN. This means Russia is contributing more than Saudi Arabia to the excess supply! Earlier in the year it was speculated that the Saudis were trying to pressure Putin to withdraw support from Syria’s Assad. Looks like Putin’s answer was just as aggressive as his military actions in Ukraine. These are temporary actions. Russia is rebuilding its $300 million cash reserve, which it had begun to deplete to defend the ruble in its economic war with the U.S. resulting from the Ukraine sanctions. Saudi Arabia has a $700 billion reserve. These are large numbers, but not that large for countries that maintain a large military and keep peace in their borders with generous social programs. Saudi Arabia now faces the prospect that no matter how long it keeps prices low, whenever it allows them to rise, U.S. shale production will immediately rise. Saudi Arabia will have problems in 2 years and face an “existential crisis” by the end of the decade. The Russians will face one a lot sooner. Putin’s term is up in 2018, and the next leader may value money over ego tricks. And finally the analysis that triggered my post … this video by Credit Suisse’s Jan Stuart ends with the observation that 4 million barrels capacity needs to be added each year to make up for production lost to wells that have ended their useful life. At current prices, no one, including the Saudis or Russians, is making that kind of investment. And demand is growing at a healthy pace. Since this is more or less a poker game, each party trying to get the others to fold, all having deep pockets, a prediction as to when it will end is useless. But as in any poker game, most players will eventually fold and it will end. The advantage of shale, now that producers have got costs down, is that it can be turned on and off quicker than conventional production wells. And the U.S. is not dependent on exporting oil. I would not go out and buy oil based on this analysis. But it encourages me to keep what I have and wait it out. What’s wrong with the stock market? Insufficient funds! In other words, the collective governments of the world are not printing enough money to pay for all the excess oil and factory produced goods that 21st century technology has figured out how to produce … at existing prices … so prices in U.S. dollars have come down by 20%. That’s de-flation, and usually not a good thing. De-flation of stocks will follow. In this respect, it is insufficient money supply to cover remarkably cost effective production that has caused the decline in oil. There is always a level of “cause” deeper than you think. The actions of OPEC have not fixed the problem, they admit. The oil crash will not end because a few shale producers are run out of business. It will end when U.S. layoffs by major U.S. producers cause enough pain for the Fed that it changes from its tightening stance. On a side note, the expected triple bottom in MORL was *not* confirmed. There is a triple bottom, but the 3rd bottom was not higher than the 2nd, so it simply means “unknown.” The strong move up today was a good sign, though. Goodbye to long term investing in individual companies! 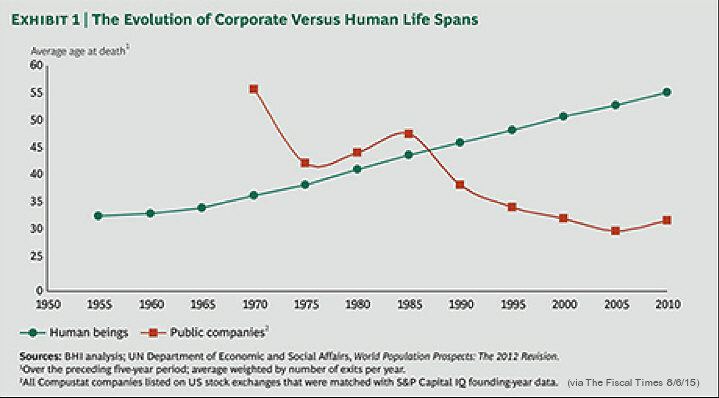 The Fiscal Times reports that public companies now have an average lifespan of only 30 years, much shorter than in the 1980s, and shorter still than in the 1950s when much of today’s still cited market wisdom was coined, such as buy and hold. There is a similar chart in The Equity Premium Puzzle (older edition available immediately) in which I show similar data, but not current through 2015, and only for the S&P 500, not the 30,000 companies in this study. I go on to analyze the effect of this on returns, and posit some reasons for it. It is not healthy. The S&P data I presented was lifetime on the S&P 500 list, not lifetime of the company itself, but it indicates a decline in the company. That number was a mere 18 years. When those companies fold and the jobs are lost, the skills are probably not applicable anymore either, and employees have to pay for additional education, during which time they lose earnings and incur debt, or accept a permanent lower income. If one invests in a broad based index the equity premium at a time horizon greater than 20 years is still applicable, and I believe it will continue to be. In general businesses will make money, or people will not start new ones – in which case the lifetime of the old ones will increase again. But as for buying and holding individual companies, like people used to do, especially in their retirement plans? I suggest forget about it. Consider the previous post today on MORL. This is a basket of companies, not a particular company. It has some limitation in that the basket does not rotate in new companies like an S&P 500 ETF would. However, at the yield MORL typically pays, you get your capital back in 5 years and you still have whatever residual value the equity is, which is a profit even if it has declined. I have an online simulator of Perpetual Portfolios, which allows you to factor in the lifetime of a basket of companies. You estimate growth and decline parameters for the average company, provide a rate at which you expect to rotate in new companies, and it calculates the average returns for various holding periods and various numbers of companies in your basket. It looks like a triple bottom has formed, or is about to form, in MORL. The middle bottom around July 27th was the lowest. This is the inverse of a classic “head and shoulders” pattern that marks a top. The inverse supposedly marks a bottom. It is called a head and shoulders bottom reversal. Another article explains both top and bottom head and shoulders patterns and how to trade them, cautioning to wait for the pattern to complete (I am always jumping the gun, it seems). If tomorrow continues the uptrend evident in the second half of today’s trading, this will be confirmed. Yield over the past year, at today’s closing price, was 26%, up from the typical 20-21%. Forward yield is probably still in the typical range, as some of the underlying components have cut dividends. If you need more dividends, or would like the benefit of diversification, or to reduce your total capital exposure to losses in dividend companies, then this might be a time to add to your holdings. I wouldn’t double them or anything dramatic like that. There might be further damage to these financial companies when interest rates rise in September. But at least some of that effect is already anticipated. I find myself having been overly optimistic about the speed of recovery in oil prices like much of the rest of the world. Rather than sell at stupidly low prices, I’ll use a little more MORL to pay down the margin a little faster. The amount used to pay margin interest, which will increase when interest rates go up, is fully canceled for tax purposes by the margin interest deduction, and I might need some more dividends to cover future higher margin rates. But eventually I’ll own outright all that stock I bought and it won’t have cost me a thing, since it was bought with other people’s money, so I don’t really get overly concerned about a paper loss. For a trader, of course, the loss is real, but not for a long term holder who didn’t use his own capital. I want to update a previous analysis I posted on MORL, as to why it is not much more volatile than its components. Most leveraged ETFs are designed to multiply the volatility, and they do, but with compounded losses. MORL is an ETN, so no compounded losses from volatility. But more importantly, it is designed to multiply the dividends, not the volatility. Now, assume the value of MORL is mostly based on dividends, and it will remain at around a 20% yield. Now suppose the underlying dividend of the component companies is $100, and increases by 10% to $110. MORL has doubled the $100 dividend to $200. It will also double the $110 to $220. How much has MORL’s dividend increased? Well, it increased by $20, from $200 to $220. $20 / $200 = 10%. Hmm, that is exactly the same amount by which the underlying components increased. The volatility of the dividend is not leveraged. And since the volatility of MORL is mostly based on its dividend, then its volatility is mostly not leveraged by the 2x ratio. This will not hold, of course, if several major components of MORL go bankrupt. But to me it means that in an ordinary business cycle, as opposed to a “financial crisis,” MORL should be no more volatile than its components. And it hasn’t been. The oil decline, which is driving most of the drag on the U.S. economy, is an ordinary business cycle. A classic inventory excess problem. Cautionary note: My friend the financial consultant who works for the same bank that runs MORL thinks it is very dangerous. But he works for a branch in a different country than the one that runs MORL, and hasn’t been able to provide any specific information into its structure, it is just his gut reaction to “leverage.” I would counter than holding just one or two of the components is even more dangerous. I was caught holding Novastar financial and Luminent mortgage when they went bankrupt, a lesson I remember well. 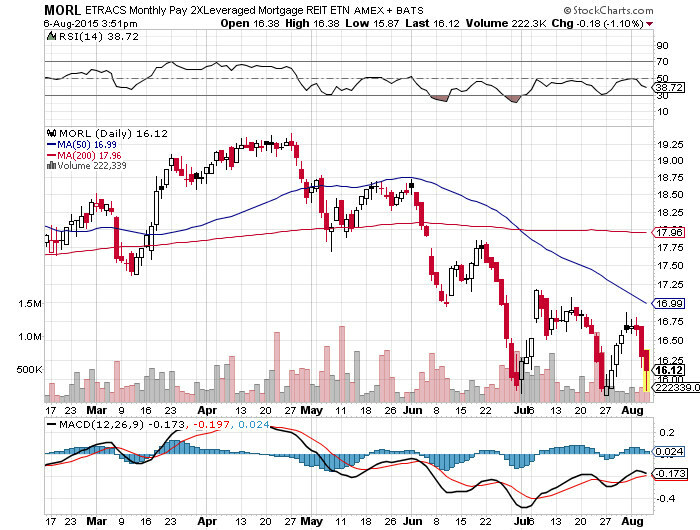 But some financial companies fully recovered and then some, which should keep MORL at least functional.